When I noted that the Fart Smeller Movement had infiltrated Occupy Wall Street, I figured it was some solo oddball taking advantage of free attention from tourists and the media. 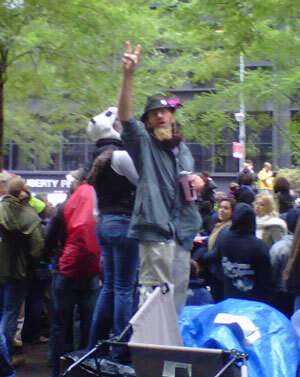 Next time, though, you feel like complaining about Occupy Wall Street, just remember it could be worse: This guy could be there. There is video posted online on MRCTV.org of a man being apprehended by police at Occupy Toronto. The person shooting the video can be heard telling police the man was in his tent, sniffing his girlfriend’s feet. He also tells police the man tried to get people in the tent to drink urine by telling them it was an energy drink. Even more disturbing is that he says the man took a sip, or “pretended” to take a sip, before trying to pass it to others. Yet, even in the Rochester fight, Alinsky’s methods often appeared rather comical, and it is rather hard to believe that they were taken seriously. According to von Hoffman, what Alinsky proposed, and scared the city’s elite with, was a scheduled “fart-in” at the Kodak-sponsored Rochester Symphony. He planned to gather black activists — for whom concert tickets had been bought — for a pre-concert dinner made up exclusively of baked beans. This would be his substitute for sit-ins and picket lines. Alinsky called it a “flatulent blitzkrieg,” and the result of this threat (along with other tactics, including the use of proxies at stockholder meetings) evidently was a settlement in which the city fathers agreed to the demands. In Chicago, he threatened a “piss-in” at O’Hare Airport, which immediately led the city to the bargaining table. That such juvenile tactics worked perhaps says more about the fears of the politicians than the genius of Alinsky.